A full version is located here. Subscribers to this blog (lootcritter.com) or my twitter feed (@lootcritter) automatically receive 1 (one) entry each per week of the contest. If you subscribe to both, that means 2 entries per week. Answers to the two weekly questions will earn the poster up to 2 (two) additional entries per week. Answers can be submitted to the following locations, or via twitter. The official thread in the Cryptic Studios forums (link to be provide with each weeks question). Or, as a reply to that weeks posting here in the lootcritter blog. You only need to enter once. Multiple entries will be ignored. Question One requires a simple answer, based on that weeks article. All entries must be submitted within 24 hours of the weekly article posting to qualify. NO PURCHASE IS NECESSARY TO ENTER TO WIN. BRIBES WILL NOT INCREASE YOUR CHANCES OF WINNING, AND ALL FEDERATION, ROMULAN REPUBLIC, AND KLINGON EMPIRE LAWS AND REGULATIONS APPLY. VOID IN THE THOLIAN EXPANSE. 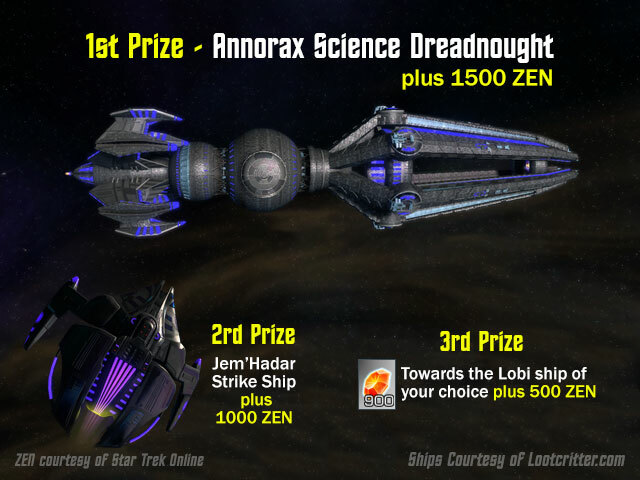 Eligibility – the contest is open to any player with a valid user account within Star Trek Online. Employees of Cryptic Studios and others associated with the promotion of this contest are not eligible. Sponsor – the contest is sponsored by lootcritter.com (this domain) and @ddesjardins. Agreement to Official Rules – participation in the contest constitutes the entrants full and unconditional acceptance of the rules, and they are fully encouraged to vote often for #TeamOmega. Winning a prize is contingent on accepting these rules. Contest Period – September 28th to October 26th 2015. Prize Drawing – will occur on October 30th 2015. Winner Notification – Prize winners will be notified in the form of a blog post on this website, and will be contacted in-game for prize hand delivery. Given that I work normal business hours, I can only guarantee delivery in the evenings or on the weekends. I will NOT MAIL rewards, and an in-game screenshot is required showing delivery. Zen will be accredited to your account by @LaughingTrendy within 7 days. 900 Lobi value for a ship of your choice from the Lobi store. Note: I will purchase it on your behalf, and provide it to you in game. Once selected, it cannot be exchanged. General Conditions – this is usually the place where I use language to weasel out of the contest in the event of a tragedy, or the game is unavailable for any reason. As long as STO is online, you’ll get the prizes. Also – no cash value either in real money or game currency is being offered. Release and Limitation of Liability – there is no guarantee that by using these ships in normal gameplay will your DPS improve, or will they make you appear to be cooler than you truly are. If the acquisition of rewards increases your heart rate to an unacceptable level resulting in personal harm, please forward your complaint to Starfleet Command. Disputes – if you dispute any of these terms, I’ll feel bad and pretty much ignore your complaints with a smile. Privacy – Your in-game handle is your business. While we will take all reasonable efforts to protect the lists (we will not use them to remarket to you), we cannot be responsible for public entries on the interwebs. Does following the blog via email count as subscribed for the contest? Previous Previous post: Website Update Today – please excuse the mess.